White Paper Abstract: Motivated to improve population health, healthcare organizations are joining forces with community organizations to bridge care gaps and deliver needed services. 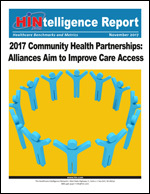 The majority of community health partnerships are designed to improve access to healthcare, say 70 percent of respondents to a survey on Community Health Partnerships by the Healthcare Intelligence Network. Eighty-one organizations shared details on community health partnerships, which range from collaborating with a local food bank to educate food pantries on diabetes to teaming up with local government to address unmet social health determinants in the community such as transportation, nutrition or housing. Download this HINtelligence report for more data on the types of community organizations with which healthcare organizations partner, the care team members with primary responsibility for community health partnerships and the chief funding source for services offered through community health partnerships.